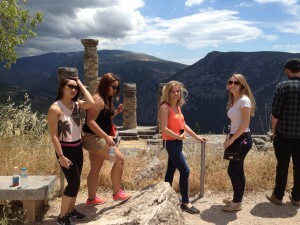 Trip to Delphi: What a Difference a Good Tour Guide Makes! On our second Saturday in Athens, we toured the Acropolis, the most popular tourist destination in Athens, if not in all of Greece, and one of the most important archeological sites in the world. Given that this was my third guided tour of the site, you might think that I viewed the outing as an obligation more than as an exciting new adventure. That was certainly the case on my second visit, particularly since our tour guide was a holdover from the first visit. As knowledgeable, passionate, and dynamic as she was, I just assumed that she was mostly following a well-worn script. I couldn’t have been more wrong. So wide and deep was her knowledge of the Acropolis, and of Greek history more generally, that I’m not sure she repeated material from the first tour even once. Accordingly, I had high expectation for the third visit, this time with a new tour guide. Once again, I couldn’t have been more wrong. I certainly don’t want to disparage the qualifications of this individual, and it may have been a matter of English proficiency (or lack thereof), but the students and I agreed that she didn’t seem particularly knowledgeable, passionate, or dynamic. After we passed some other English-speaking tour groups, some of the students verbalized the question that I was asking myself: Can’t we join one of those groups?! I was disappointed for the students and frankly annoyed that they weren’t able to have the same high-quality, engaging educational experience that I had during my first two visits. Fast-forward to this past Saturday, when we embarked on an all-day outing to Delphi and nearby Arachova village. 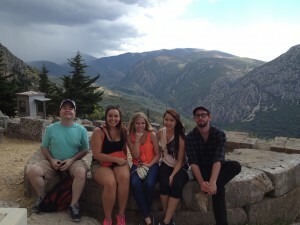 We were all a bit apprehensive given our previous experience, though we were fortunately assigned a different tour guide. 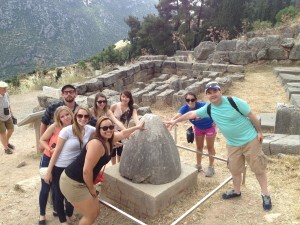 After a two-and-a-half hour bus ride, we arrived at the ancient home of the Oracle, which according to myth was selected by Zeus as the center, or navel, of mother earth (the egg-shaped object we are touching in the photo is a representation of a navel, a replica of one the priestesses were believed to use as a sort of tactile crystal ball). 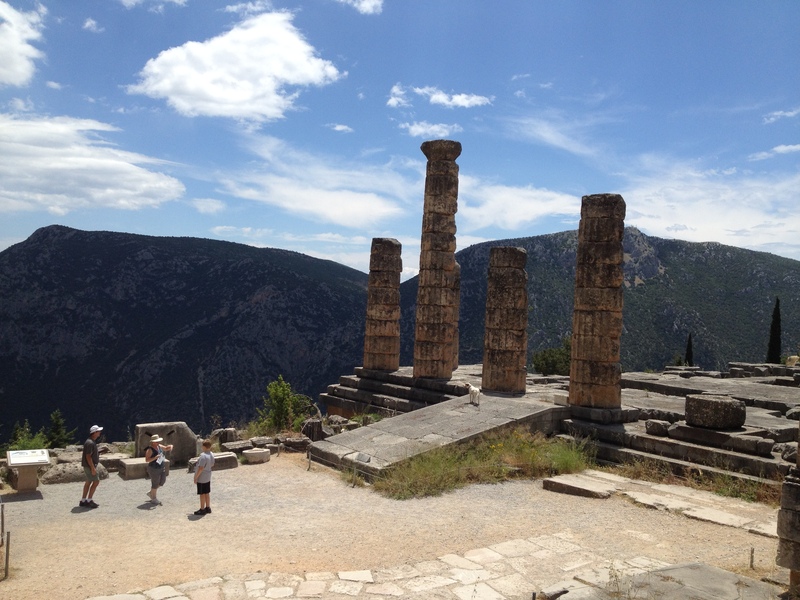 As the legend goes, Delphi was later established a sacred site by Apollo, to atone for his slaying of Python, the dragon that protected the site; as the site’s prophetic deity, it was Apollo that the priestesses served. Upon our arrival, we were immediately greeted by Ageliki, who quickly ushered us off the bus and made a few good-natured jokes at our expense. I knew immediately that I liked her (and I think the students concurred). 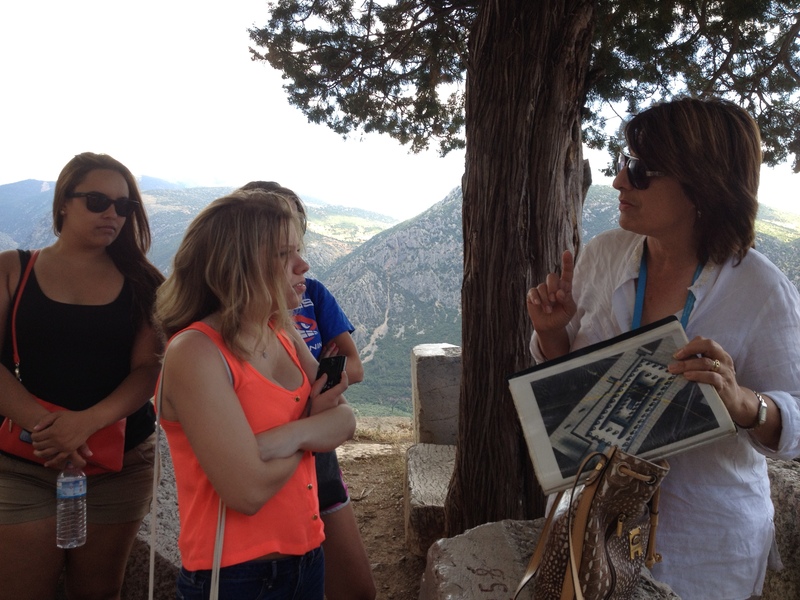 Over the course of the next two hours, Ageliki led us through the site itself and the associated museum, stopping only at the most important artifacts and ruins, while nevertheless providing a comprehensive account of the site’s history and drawing a rich portrait of what daily life at Delphi (or rather monthly life, as the priestesses only worked once a month!) might have been like. Her expertise, wit, and good sense of how much information is enough reminded me what a difference a good tour guide can make!